Model M202- Utilising a range of Black accessories, this model has a 10mA 100mV Full Scale Deflection. 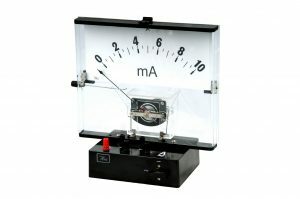 It can be converted into a Galvanometer with a sensitivity of 5–0-5mA and a resistance of 10 Ohms. Model M203- Utilising a range of White accessories or separate multi-range voltage and current units, this model has a 1mA 100mV Full Scale Deflection. It can be converted into a Galvanometer with a sensitivity of 500–0-500µA and a resistance of 100 Ohms. The non-dedicated dial enables the same dial to be used for several applications making the instrument more economical than integral dial – and – accessory type instruments. A range of dedicated shunts, multipliers and dials is available to make this a versatile instrument. The sealed, dust-proof Perspex case allows a clear view of the functional parts and the externally fitted clip-on dials protects the instrument movement from damage or contamination. The pointer can easily and safely be adjusted between either centre or side zero positions.